This is a large, sprawling shrub growing 5-12 feet tall, one of the first to leaf out in the spring. Elderberry can be a showy ornamental for the garden, producing attractive flowers and berries all season long. It will tolerate a wide range of soils, but prefers moist, organic soils in full sun to part shade. The yellow compound leaves turn golden in the fall, if planted in full sun. This native shrub can spread aggressively by root suckers, forming thickets, so it is best massed in naturalized areas or in shrub borders, roadside plantings, or as a screen, particularly in wet or low areas. Heavy pruning periodically will help control its growth. Elderberry is found in all counties of Virginia and is native throughout eastern U.S. and south to Mexico. 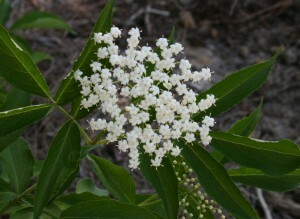 Large, flat-topped clusters of fragrant, star-shaped white flowers appear in June through July and are followed by clusters of reddish-purple to black, berry-like fruits (drupes) in late summer to fall. The flowers furnish nectar and pollen to insects in the spring and in the fall over 43 species of birds enjoy the fruits. This is a highly desirable plant for wildlife, and it is moderately resistant to damage by deer. In West Virginia, concentrated fruit syrup is made as a wintertime remedy for colds and flu; studies have shown its effectiveness for treatment of colds and flu. While the bark, root, leaves and unripe berries are toxic, the fruits are edible when cooked, and may be used to make preserves, jellies, pies and wine. The flowers, not toxic, can be eaten in pancakes and fritters, and elderberry juice is a nice cold drink. For more information about native plants visit www.vnps.org.